In nearby Fall River, Massachusetts there’s a great little Lebanese commercial bakery called Sam’s Bakery that supplies many of the local supermarkets and delis with delicious pita bread, savory hand pies, and other Lebanese specialties. Only the locals know that they also have a hidden storefront right at the bakery that’s open to the public five days a week. Their prices are ridiculously cheap, and there’s nothing better than walking in and grabbing one of their still-warm-from-the-oven spinach pies for a quick lunch. Be forewarned: if you do decide to visit Sam’s, expect no frills. Every time I stop in I can’t help but chuckle to myself as I’m reminded of the infamous "Soup Nazi" episode of Seinfeld. The line at Sam’s is almost always outside door, but no one seems to mind because the food is that good. Once you’ve made your way to the front of the line you better know exactly what you want and order it quickly, or otherwise you’re sure to be served a dirty look and sigh of annoyance by the staff. It’s at this point that I can’t help but feel a bit of anxiety, hoping that the lady across the counter doesn’t yell “no spinach pie for you… next!” It hasn’t happened yet, and I guess it is just a small price to pay for their incredible, authentic Lebanese treats. I had planned on attempting to duplicate their spinach pies at home and bought all of the ingredients earlier in the week. Unfortunately, I never got around to making the dough, and so I ultimately decided to try to incorporate the same spinach pie ingredients and flavors into a quick pasta dish. The one distinct flavor that sets Sam’s spinach pies apart from others I’ve tried is their use of lots of lemon. When you bite into one of their pies, a heavenly garlic and lemon scented juice begins to immediately pour out. I wanted to capture the essence of that juice in the sauce for my pasta. The result was a dish that was equally good enjoyed warm or at room temperature, perfect for a simple lunch or a side dish. Don’t waste your money on baby spinach for this recipe. I find that regular fresh spinach has more flavor, and since it is going to be finely chopped, it’ll hold up better in the sauce anyhow. Cook the pasta in generously salted water according to package directions. Reserve ½ a cup of the cooking liquid, drain, and set the pasta aside in a large bowl. Heat the olive oil in a small sauté pan. Sauté the leeks with a ½ teaspoon of kosher salt over medium heat until the white parts are translucent, about 20 minutes. Turn off the heat and add the lemon juice, lemon zest, garlic, and black pepper. Add to the bowl of pasta. 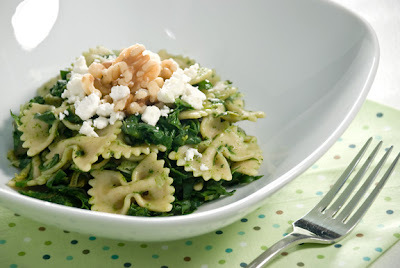 In a food processor puree 1 cup of the chopped spinach with ½ cup of the reserved pasta cooking water until smooth. Add the spinach puree, along with the remaining chopped spinach, to the pasta bowl. Toss to combine all of the ingredients and taste for salt and pepper. The walnuts and feta can be tossed in too, or sprinkled on top of each serving. Serve warm or at room temperature. I loved this - the lemon was perfect. I can't wait to try this in a calzone. Thanks for posting. Now I don't want muffins tomorrow, I want Sam's! Love the soup nazi comparison! This plate looks delicious! Great recipe, it was delicious. Thanks for posting! I loved this - the lemon was perfect.I can't wait to try this in a calzone. Wow, what a amazing piece of cleanliness in your hands this recipe was absolutely great and delicious too, thanx for posting. he pasta was very good. I used whole wheat pasta but that was the only difference. Godd pasta but is missing the WOW factor.Would make again though. I made this for a group of hungry rowers and they loved it. I also made a version without meat and it turned out great. Thanks. i admire how the blog was made. so cute yet the simplicity is still there. the picture itself made me hungry. it was shot perfectly it looks like real. hope to try that one too. I thought this dish was simple and delightful! I made a 2-portion version in a little casserole dish, and eyeballed all of the ingredients. I added a couple of mushrooms, used a shallot instead of onion, and used fresh spinach instead of frozen that I sauteed in the pan with the shallot and garlic.